i was at a friend’s house one night and he whipped up some pesto and pasta, served with large pieces of roasted butternut squash on the side. it was such a good idea–i speared a soft piece of squash and rolled it right into every bite of pasta and pesto. the flavours worked so well together that since then i usually roast some squash whenever i plan to have pesto and pasta. but a discovery i made on my own, was how delicious red chilies taste with that combo. i mean it’s true, there’s not much that i don’t like chills with, but i wouldn’t throw, say, sriracha hot sauce onto pesto. i find that the pure flavour of red chilies really adds to this squash + pesto pairing. i either add whole fried red chilies on the side, to bite into between mouthfuls of pasta and squash, or i take chinese hot chili flakes in oil (thinned out with a little olive oil if the flakes are dry/clumpy) drizzled on top. but i think best of all, is my latest pasta-less variation seen above. 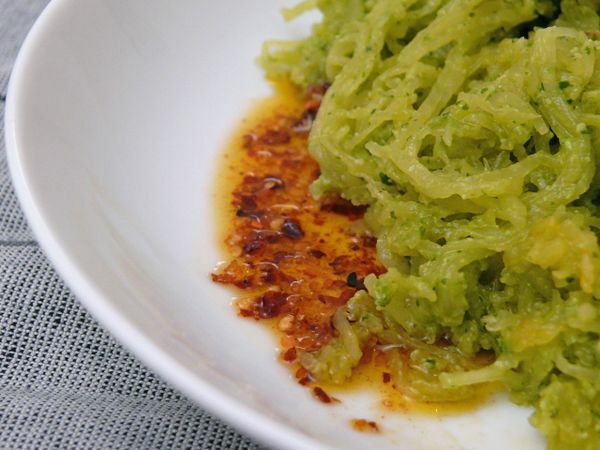 spaghetti squash with pesto and chili oil is simply addictive…if slightly painful. but that’s part of the what hooks you. if you want to try it, just roast a spaghetti squash (cut in half, seeds removed, face up, drizzled with oil, salt and pepper) at about 375 in the oven for 40-50 minutes depending on how big your squash is. rake out the cooked flesh with a fork and toss the strands in a bowl of pesto.mix well and dish out with as much chili oil as you can handle–to me, the chili oil doesn’t overpower the flavourful pesto or the sweet squash, it keeps you going back for more. and you can justify eating way more, since really you’re just eating vegetables! with, you know, kind of a lot of oil…but still, lots of vegetables! Next Articlei love you, family!